According to The Huffington Post, one of the best ways to fight Seasonal Affective Disorder (SAD) in the fall and winter months is to spend more time outside. Even on less-than-sunny days, you’ll get enough light from being outside for even a short period. So, don’t let your backyard space go to waste when temperatures drop! Instead, implement a few of these weatherizing ideas that will make you want to spend time in your private outdoor space, all season long. Your lawn or outdoor furniture shouldn’t be the same in fall as it was in summer. Clear out those summery lawn chairs in favor of folksy, cushioned outdoor furniture. If you have all-season outdoor furniture, then be sure to swap out summer-colored pillows, candles, or decorations for muted colors of orange, brown, and green. You’ll be more likely to use your fall backyard if you have ways to warm yourself up. A fire pit is an especially pleasant option, especially one that stands alone and doesn’t need to be dug into the ground. Make the fire pit a conversation piece by setting up chairs around it. 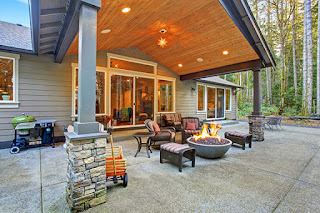 In terms of home resale value, too, a fire pit can make a big impact. Homeowners who create outdoor fire pits can see up to an 80% return on their investments. Many backyards look better—and are appropriate for more seasons—if they have outdoor fireplaces. If you hire a contractor to build a fireplace, you’ll likely want to consider materials like brick, stone, or granite. A trend in the cooking world is outdoor fall grilling. Southern Living magazine recommends grilling pork chops with an apple-bourbon glaze to transform your summer hamburgers into in-season fall foods. If you want to do more than just grill, consider adding a full outdoor kitchen around your grill, as well. Absolute Outdoor Kitchens suggests that your ROI will be 100% and 200% when you sell your property later. Prepare the deck for winter – and one last fall hurrah! The heat of the summer sun can really give your deck a beating. So, the fall is the best time to care for your outdoor space by pressure-washing your deck and re-staining your wooden porch. Once the snow of winter comes, then you won’t have the change to complete this work until the spring. After your deck is ready, you can host one last fall party on a porch structure that looks like new. Remember, fall is still an outdoor season! You just need to make a few tweaks to make time in the outdoors feel as pleasant as it did in the summertime.